In this tapestry "New Enchantment" by John Douglas, we see a city scene of the Mediterranean in a fantasy like style. The beauty of this region of the world is captured here with a hint of exoticism which is a signature of Douglas' works. His works specialises in far and exotic locations and in this tapestry, we see a blend of scenery and an elaborate and most decorative accompaniments in the border which includes designs suggesting a blend of Classical European and Arabian art with a modernity created by the abstract cubism in the lower part of the city scene to create an enchanting world, through new eyes. And all in sumptuous rustic tones which simply draws the viewer in. The location is a mystery as is the story behind the scene and the world it is hinting at, which is left to the imagination of the viewer. A truly exotic cityscape scene from Douglas. 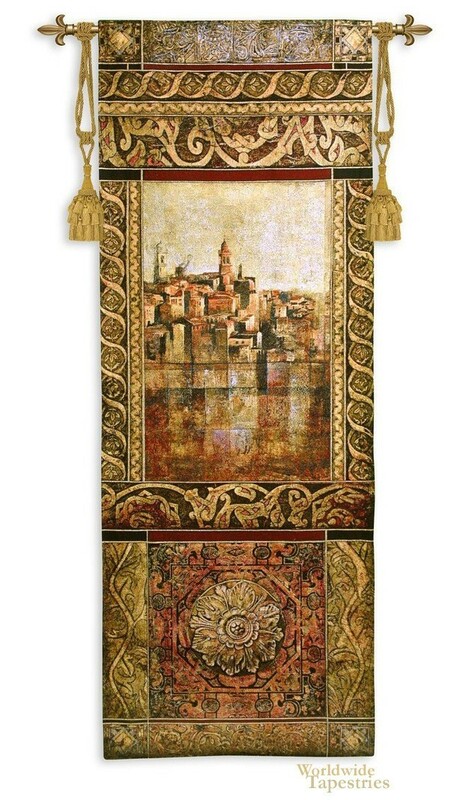 This cityscape tapestry "New Enchantment" is backed with lining and has a tunnel for easy hanging. Note: Tapestry rod and tassels (where pictured) are not included in price. Dimensions: W 25" x H 69"